Chicken Arugula Rice Salad with red peppers, almonds, and a sesame dressing is a protein-packed POWERHOUSE salad, you’ll want to pack up for lunches and enjoy all week long! I hope you have diced and cubed Baked Lemon Pepper Chicken or Blackened Blackened Chicken Breasts in your freezer…or any leftover chicken at all. 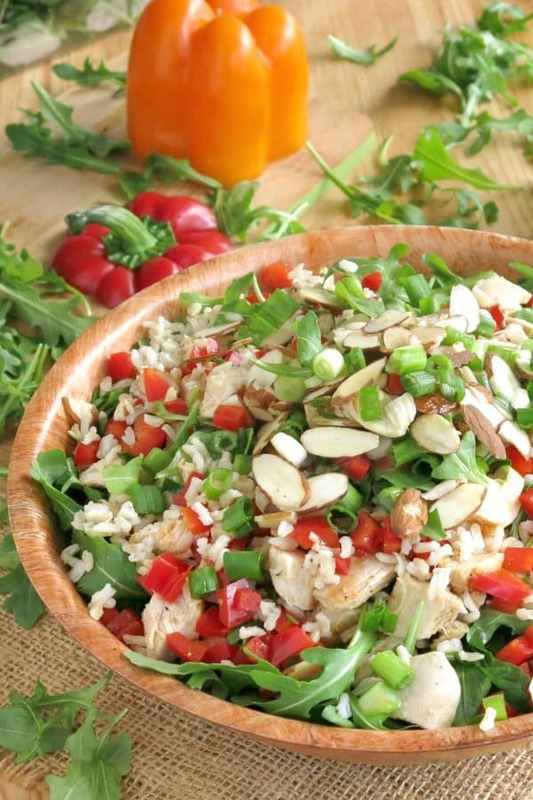 If so, this healthy, gorgeous and delicious salad is ready in under 30 minutes! It’s a quick and easy dinner or it’s lunch for the next 4 days! And, you won’t get sick and tired of it either! There is something addictive about the crunchy, nutty and peppery flavor paired with the light sesame dressing. Brown rice – cooks in 10 minutes when parboiled or instant brown rice is used. Regular brown rice is fantastic too and if I have the time or some already prepared, we use this type instead. Either way, I always choose brown rice over white! Arugula – is a cruciferous vegetable, similar to cabbage, broccoli, and collard greens. (Did you think it was a salad green?!) We used baby arugula leaves. Red peppers – are full of vitamins, minerals, and antioxidants. They are green peppers that have fully ripened on the vine. So they are sweeter and pack a little more nutritional punch than the green variety. 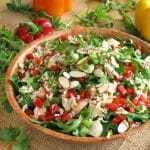 Almonds – give this salad crunch and add healthy fat, fiber, and protein. Green onion – use the green and white parts! Chicken – Keep a bag of diced chicken in the freezer and a protein-packed dinner is never difficult. This dressing is very similar to the one used for delicious Chinese Napa Cabbage Salad. 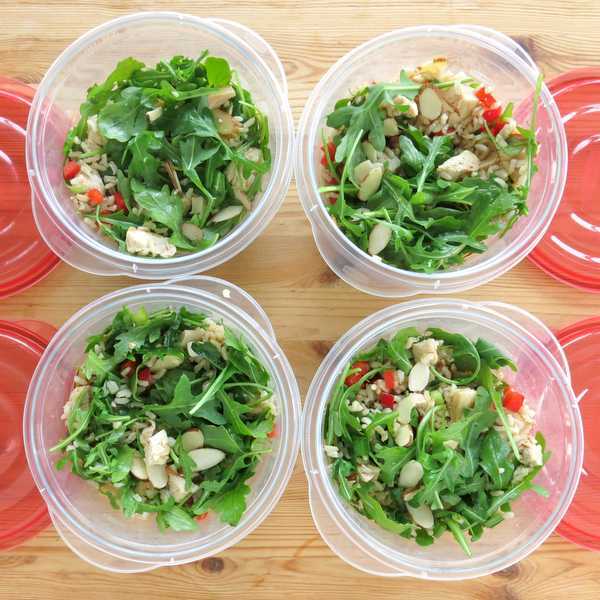 Break the salad into 4 portions for quick lunches or dinners. Normally, the salad dressing would need to be added just before serving, or strategically placed at the bottom of a container as we did for Layered Taco Salad in a Jar. However, hearty arugula holds up well and tastes great marinating in dressing for a few days. Leave out the chicken and serve as a festive side salad! It’s perfect for the holidays. Add a different protein, like leftover turkey or tofu to keep it vegan. Substitute a different grain like farro or use quinoa instead of rice. Top with cashews instead of almonds. Add pepitas or sunflower seeds to give more crunch. Add dried cranberries to add a fruity punch. 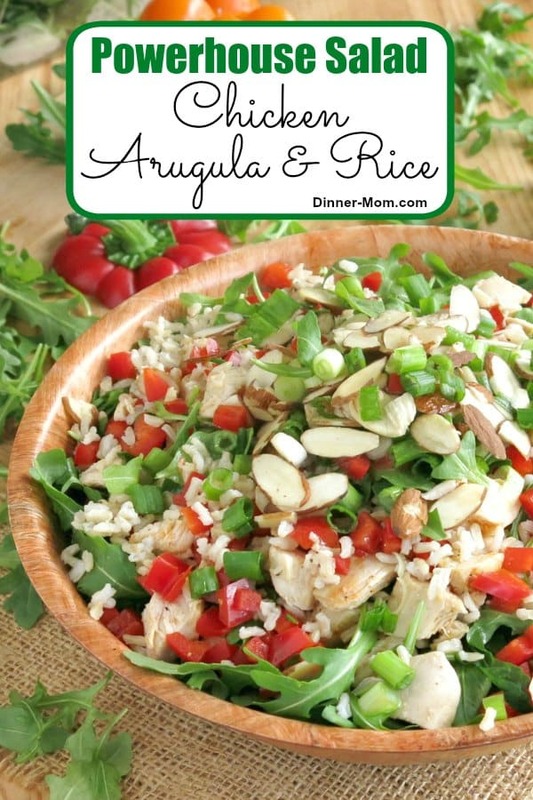 Looking for more ways to use arugula? Check out Arugula Pasta Salad by Two Peas and Their Pod and Wilted Arugula with Balsamic Vinegar by Inspiration Kitchen. Please rate this recipe and tag @DinnerMom or #DinnerMom on social media! We love to see what you are cooking up! 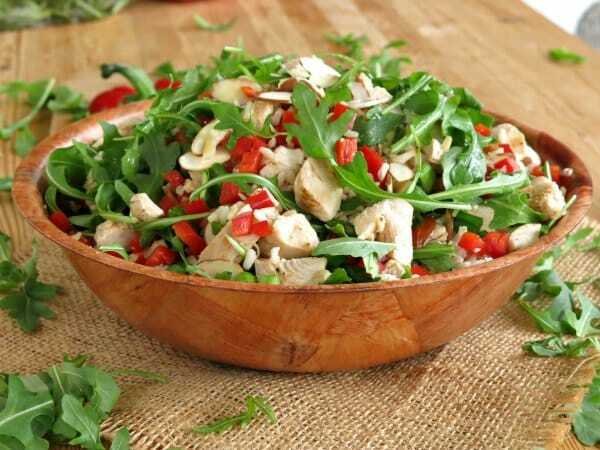 Chicken Arugula Rice Salad with almonds and red peppers is tossed with a tasty sesame dressing. It's a quick and easy crowd-pleaser! Cook rice according to instructions and transfer to serving bowl when done. 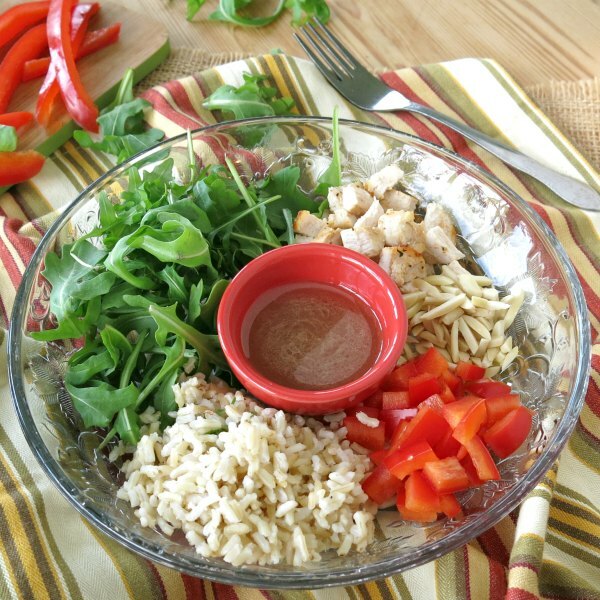 Toss rice with chicken, arugula and red pepper. Whisk dressing ingredients together in a small bowl and pour over rice and chicken mixture. Toss salad to coat with dressing. Top with almonds and green onions. I make this combination often when I have leftover chicken. The arugula holds up for days which is great for lunches. Thanks for your feedback! I’m so glad you like it! I adore rice in a salad, but the sesame is what takes this one over the top! YUM! I love a delicious and super fresh salad! This is absolutely it!